First and foremost, let’s get my ‘time flies’ statement out of the way. HOW IS MY BABY 3 MONTHS OLD!? Time flies! Overall, we’re doing well! I feel like Vishnu and I found our parenting rhythm this month. For one, we can now read Kaiden’s cues really well. I now know his I need to burp cry, his hungry cry, and his sleepy cry. As far as our dynamic goes, I can say without a doubt that Kaiden knows we’re his parents (or two people who won’t ever go away). And I’m happy to share when chaos ensues, I’m able to calm him down pretty quickly. Vishnu can too, but I think he takes to me a bit quicker since I’m with him all day. Kaiden is finally settling into a loose morning schedule in terms of meals and naps. I’m able to respond fairly quickly because I can anticipate what he’ll need when. The only thing in the napping department is that he’s most definitely a cat napper with naps ranging from 20-45 minutes. It’s to the point where if he sleeps any longer than that, I automatically think something’s up. Ha! In terms of meals, I’m happy to report that Kaiden is now drinking higher volumes of milk. No more incremental feeds! He’s finally in that 4-6 ounce range. Phew! As far as nighttime sleeping goes, Vishnu and I are VERY lucky. I know things will likely change, but for now, things are going really well. We usually put Kaiden down between 6:30-7:00 pm, and he usually wakes up again between 3:30-5 am (depending on the day). There have been a few exceptions, but they’re far and few between. We still very much give credit to the Baby Merlin’s Magic Sleepsuit. It’s truly magical! Kaiden is also getting more and more interactive by the day. He loves it when we make different noises and tries to imitate us. It’s the cutest thing ever! Right now, after he sees me stick my tongue out at him, he attempts to stick his out at me. Gah! His cooing is also out of control. He has a lot to say. Vishnu and I can’t wait until he actually starts talking! And you guys, his smile melts my heart. It’s the gummiest, most adorable, and sweetest thing ever. I can’t get enough! Kaiden loves being held, especially by his mama. On the flip side, he doesn’t love being in the same spot for too long. This makes for very interesting days! In other news, he’s definitely in the grabbing phase – our fingers, his hair, etc. I’m trying to get him to grab his toys with a bit more intention. The other day he sorta kinda grabbed his rattle and shook it. That made this mama very happy! Don’t get me wrong. Kaiden does cry and get crabby sometimes. But even his cry is cute. He puffs out his lower lip and then starts wailing. We giggle a little every time! 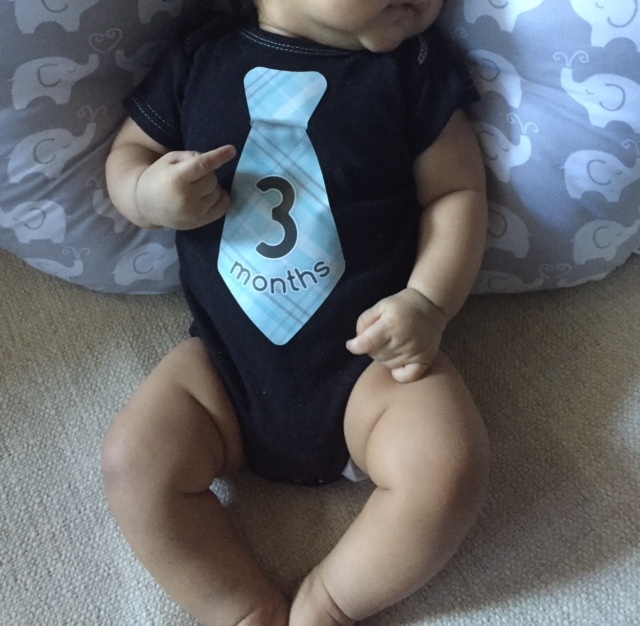 Overall, Kaiden’s a very happy and calm baby (unless he’s hungry…that’s another story!). Month 3 was a good one. Overall, I felt positive and calm. Of course, I had my days, but they weren’t the norm by any means. My mama mantra at the moment is ‘enjoy today.’ My friend Erin shared this with me a while ago, and while it resonated at the time, it’s really hitting home now that Kaiden is here. Right now, I’m working through my emotions about going back to work. I’m currently at the point where I’ve convinced myself everything will be ok. I want to focus on integrating motherhood, life, and work in a way that works for us. Hoping I can stay this positive for the next four weeks! Something else I’m trying to be better about is staying in touch with other local moms. I’ve made a couple of good friends in the past few months and am really loving the connection. My new gal pals just get it! Like I said, I’m doing well overall. I have so many blog posts I want to write and share, but finding time for it all is a bit tough. I find that staying ahead of the game as much as possible helps, but I also don’t want that mindset to become the norm because I don’t want to lose the magic of the present moment. It all passes by way too fast! As I’ve shard before, this year of training is the most weekend heavy of them all. Particularly the first six months (which we’re currently in the middle of). To be honest, I was expecting the worst, but it isn’t so bad. Sure, we hate it when he’s gone for 24 hours on a Saturday, but it’s doable. Thankfully, we’ve either had guests in town those weekends, or I’ve been able to convince Thea to come hang out with me! Ha! Despite being busy at work, Vishnu and Kaiden have truly formed a special bond. I can’t wait for it to get stronger as Kaiden grows up. I see lots of soccer games, football Sundays, and general mischief in my future! While Vishnu and I have always stressed the importance of good communication in our relationship, it’s gotten stronger and better over the past few months (as measured by the number of times we snap at each other!). We see ourselves as teammates and want the other person to be successful in this new role. This mindset makes a huge difference! Vishnu and I both also feel the heaviness of parenthood settling in. We now get what our parents meant by “you’ll understand when you’re a mom/dad one day.” The love we feel for Kaiden is so intense, and it’s hard not to get anxious about ALL THE THINGS! It does feel good to acknowledge this feeling and hear your partner be vulnerable about it too. In my mind, that’s the best first step! And this is when that mama mantra kicks in…enjoy today! Here’s to a great month 3 and an equally great month 4*!